Thank you so much for your positive response to my cookbook. You can see Johanna’s review of it here. I have been debating whether to go on a complete blog hiatus during the summer or work on some pre-written posts. I am leaning towards a blog vacation simply because my absence will be too long for me to mask or simply dwindle down to a post once a week. When deciding what to share this week (while I was on vacation last week), I had to see what was lurking in my archives. (Note: I should have added one more tip for food bloggers: have draft posts and lots of them). As such, I have been hunting through my archives of not-yet-published posts. You know – the half-written posts, the posts without any photos uploaded and the worst – the ones without a recipe. As soon as I discovered these photos, I knew I wanted to share them. The glowing strawberries are oh-so-ripe and the drizzle of balsamic layered nicely around the oats. I would love a bowl of this right now. Truthfully, I don’t remember making this but my photo time stamp tells me it was 2011. Obviously around strawberry season. Perfect timing because Ontario strawberries are just starting to appear, as we found out this weekend. This dish was from a time when I used to toast my steel cut oats as I waited for the water to boil. Now I don’t bother. It was before I started adding protein powder to my oats. My current concoction is a murky green stew but I am not sure if that is any better than my previous (chocolate) brown variety with berries. I used to share a lot of my morning eats but with my morning monotony there is not as much day-to-day novelty. I already shared a Balsamic Lemon-Blueberry Steel Cut Oats which was likely my inspiration 3 years ago. 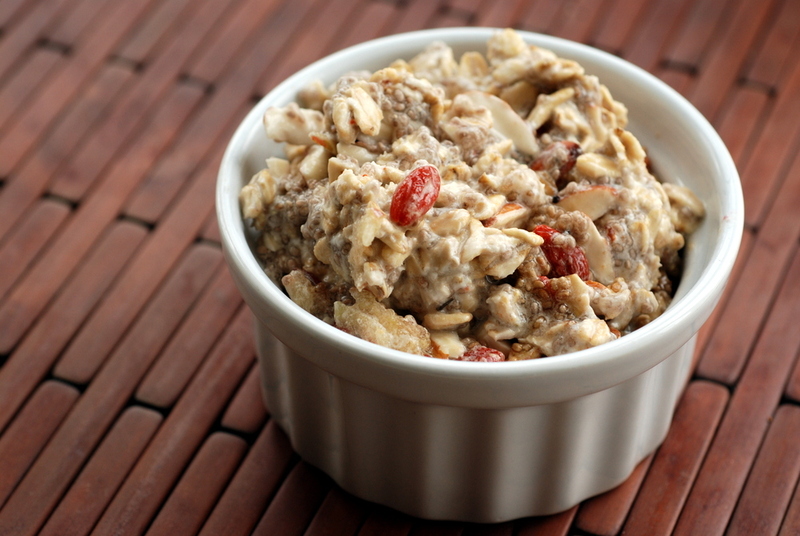 Be it resolved to change my morning oats this week? Absolutely! How about you? Do you have a similar breakfast every day? Any preferences for my blog sabbatical? I am toying with the idea of a few summary posts (like the best vegan restaurants in Houston and Toronto). PS. I am sharing this with Four Seasons Food for Red, Shop Local, and Simple and In Season. The recent cold, wet and rainy weather put a temporary hiatus on our weekend cycling. Thus, with a bit of extra time on our hands last weekend, Rob and I crafted a delicious weekend brunch. Rob was becoming a bit overwhelmed by our weekly banana surplus. I agree 4 bunches for a $1 is great, but probably not the best idea 2 weeks in a row. 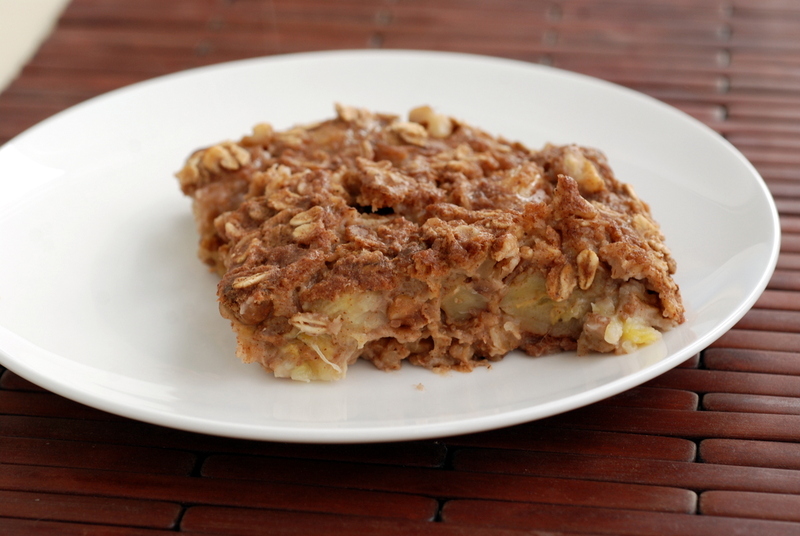 After packing our freezer with frozen bananas, we then caramelized the leftovers ones into this spin on a bananas foster baked oatmeal. There are two ways to make this. When Rob and I team up together, we can easily divvy up the tasks: him caramelizing the bananas, while I mix together the rest of the oatmeal, which are then combined before baking. However, I have also made this solo, where I found it easier to simply caramelize my bananas, deglaze them with the milk and then directly mix the rest of the ingredients in the skillet, which is then subsequently baked. Less dirty dishes is always a perk. While we have added the rum, we couldn’t really taste it, so it is definitely optional. Or, conversely add more if you want to taste it. Or perhaps drizzle it at the end. PS. The winner for the Raw & Simple giveaway is Emma. Which food makes you giggle? An automatic response because you just don’t want to eat it. While I have cooked and baked with prunes before, I subconsciously think of my bowels when I see prunes. I know it isn’t just me, because the folks in California have been rebranded prunes as “dried plums“. So many less connotations, while using different words. Dried dates, apricots and cranberries get a lot of love, but prunes are rarely heralded. It wasn’t until I picked them up on a whim that I remembered how nice they taste. They aren’t as cloyingly sweet as dates or raisins, and have a much more complex flavour: deep and robust. If you’ve been reading my blog for a while, you know I love to explore new breakfasts, although I rarely share them these days. 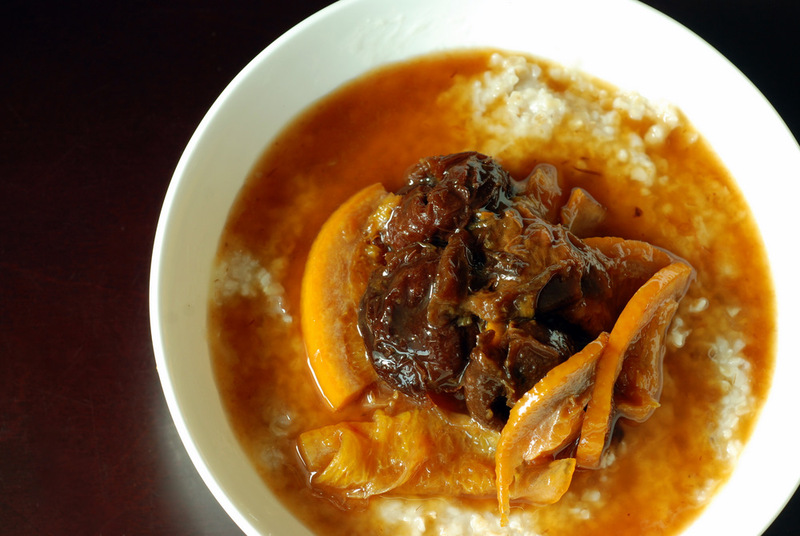 I spotted this recipe for stewed prunes with citrus and cinnamon and figured it would be a great topping for my morning oatmeal. 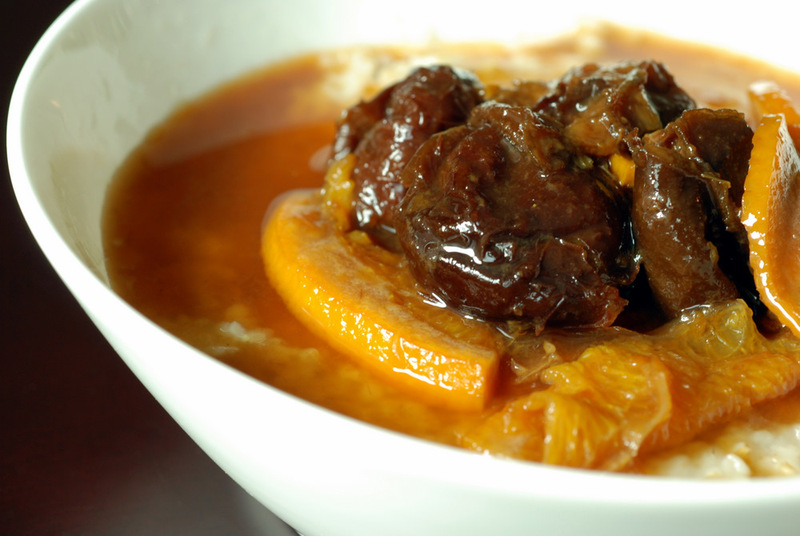 I was drawn to this recipe for stewed prunes because there is no added sugar and the sweetness comes entirely from the prunes and orange. In fact, the sweetness is tempered by including the orange peel in the pot as everything simmers. 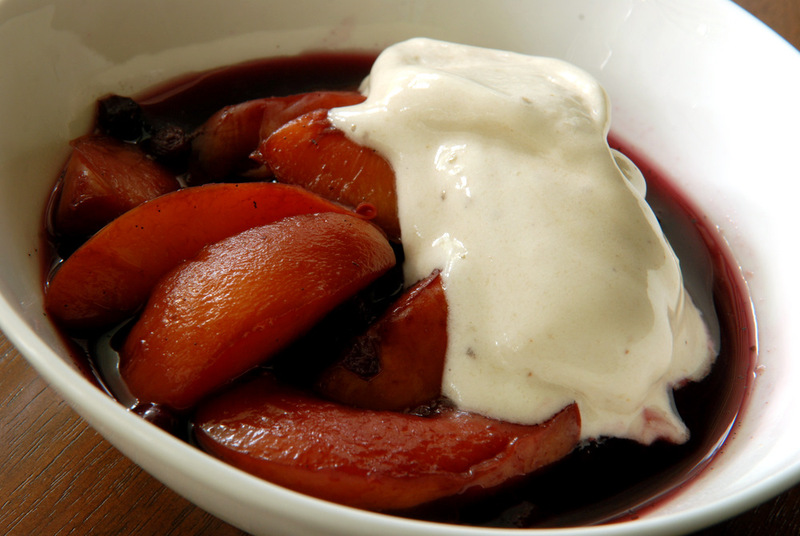 A dash of cinnamon permeates the succulent compote and melds seamlessly. I halved the original recipe since I didn’t have a pound of prunes. I used half a Navel orange, cut into thin slivers, which delivered a wonderful flavour. Don’t be off-put by including the entire orange, peel and all. It works. Really well. 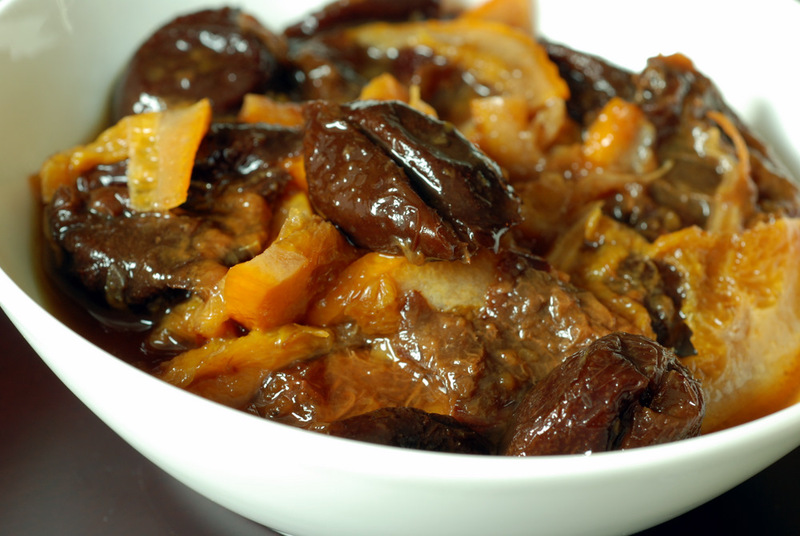 Just as Molly suggests, the silky prunes develop a complex flavour throughout its hour-long simmer. Overnight, in the fridge, the flavours meld further. 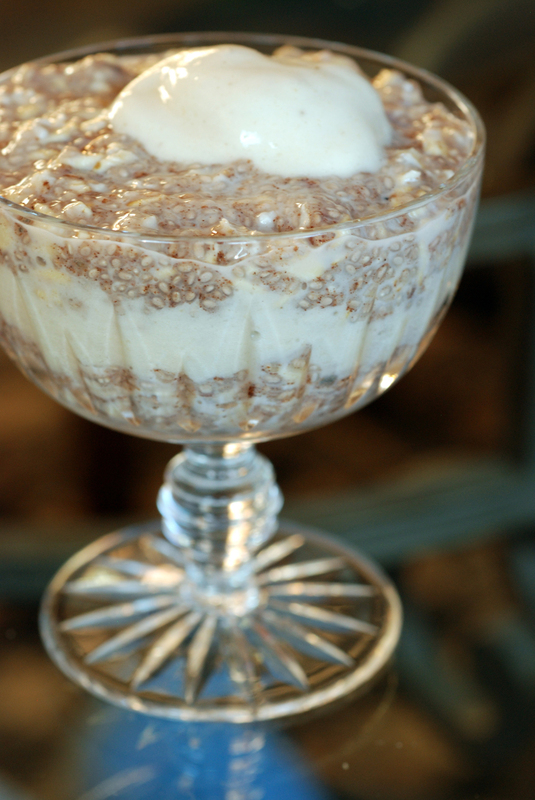 It was a delicious topping for my morning oatmeal and could easily top some yogurt or ice cream, if you are into that, for a delicious dessert. Warm and cold, I loved it both ways. What are your favourite ways to enjoy prunes dried plums? This is my submission to this month’s Tea Time Treats with dried fruit and this month’s Credit Crunch Munch. PS. The winners of Plant Powered 15 are Johanna and Kari. Wow, once you start, it can be hard to stop. I may have unrawified the quinoa wraps, but I have been noshing on lots of great raw eats all week. I also ventured away from my standard chocolate oats, and re-entered overnight oats territory. 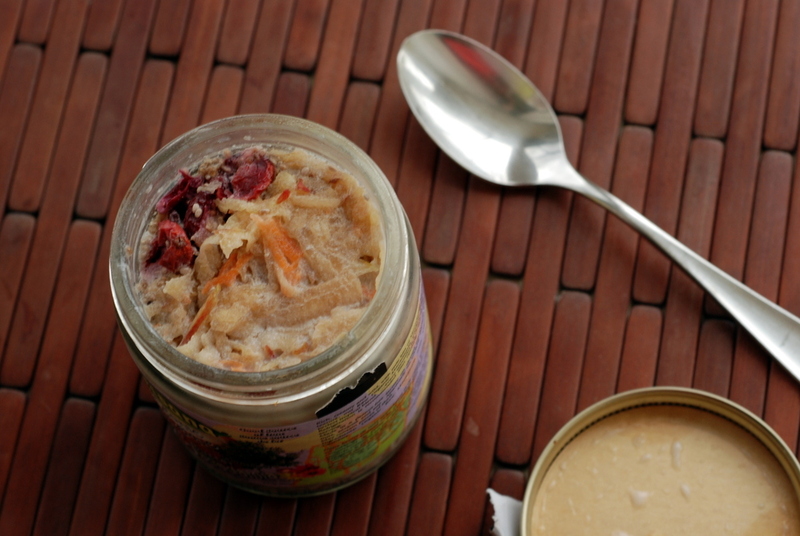 For some odd reason, I usually only eat overnight oats when I have an empty container of nut butter. 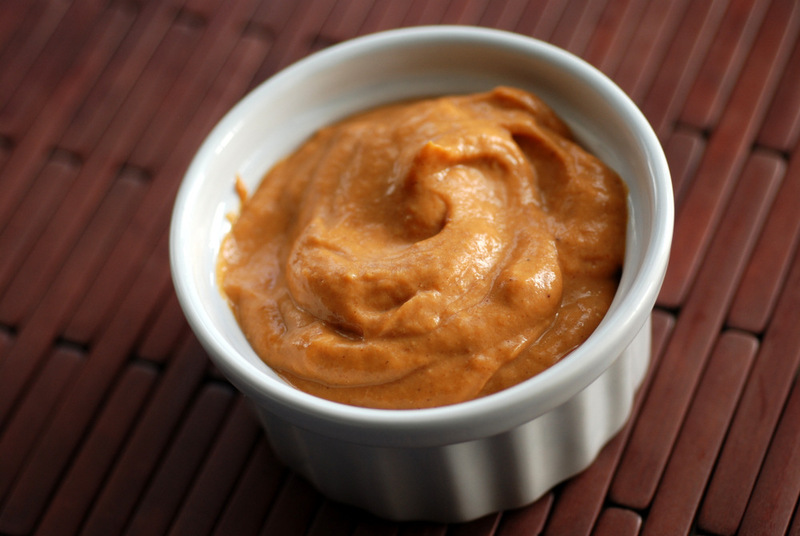 The overnight soaking allows you to absorb all the rest of the nut butter on the sides of the jar. I like how simple changes can truly transform my breakfast. 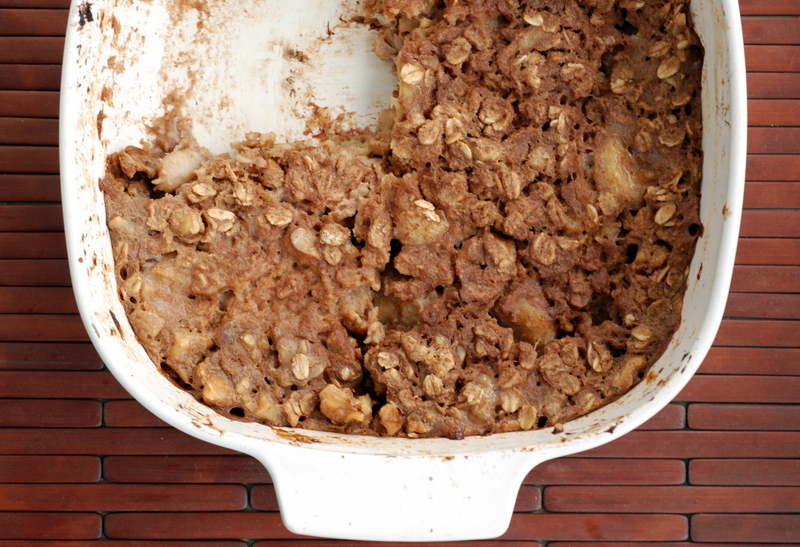 I routinely add fresh fruit to my oats (especially apples), but I usually just chop them up. However, this time I made a spin on Swiss muesli. 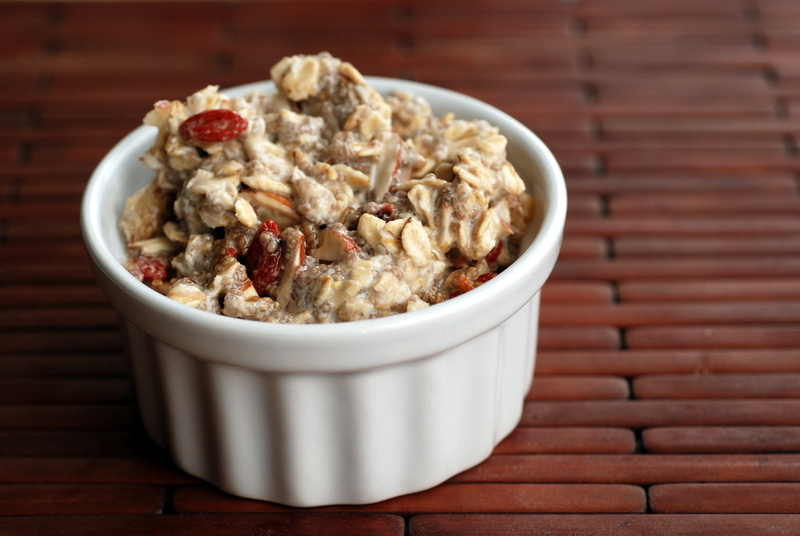 Nowadays, muesli is more akin to uncooked granola, heavy on rolled oats, nuts and seeds, although Dr. Bircher-Benner’s original recipe called for far more fruit than grains. When I think of Bircher muesli, I associate it with the grated apple. Not chopped, grated. Grated apple was a fun twist. 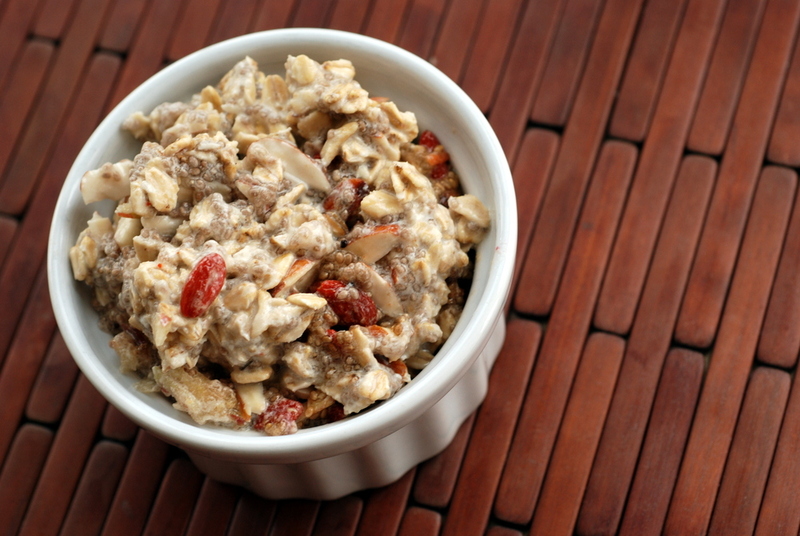 I ran with Gena’s recipe, which updated the classic recipe by including chia seeds, dried fruits and chopped almonds. The textural contrast from the soaked chia seeds, creamy oats, grated sweet apple and chopped almonds was a delicious treat. Trying to clear out my pantry, I tossed in some dried goji berries and my homemade unsweetened dried cranberries. I don’t normally like goji berries (I think I’ve had the same package for over 2 years), but found they were fantastic in here. So much so that I am sad I cleaned out the last of them… and trying very hard not to run back to Chinatown to buy some more. Must. Resist. Buying. New. Ingredients. 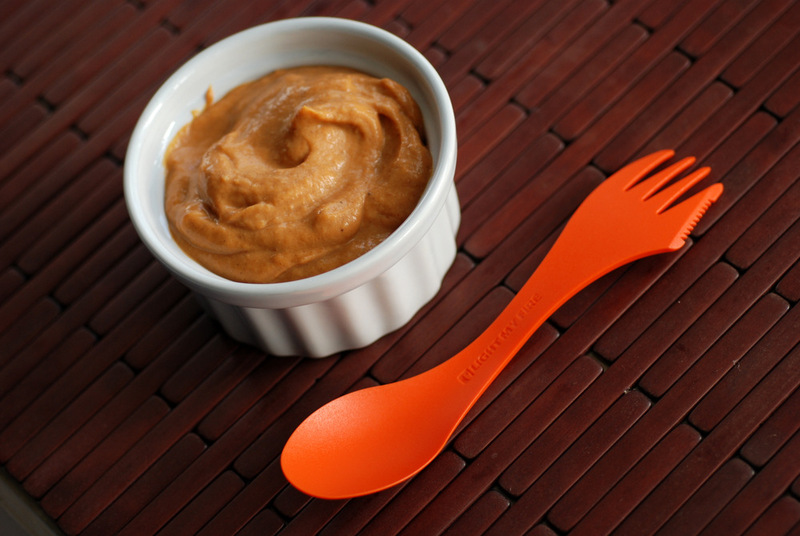 Do you do the nut butter jar trick? Have you tried goji berries? What are your favourite recipes? And last, but not least, the winner for my cookbook giveaway is Ellen! I will contact you to get your shipping address. This is my submission to this month’s No Waste Food Challenge for fruit, this week’s Raw Food Thursday and to this month’s Breakfast Club for rocket fuel. I retired my food processor. 1. Chop your bananas before you freeze them. That was how I broke off both clips on the side of the bowl. Huge chunks of frozen bananas jumped around the bowl and snapped it off, literally. Have no fear, that was nothing I couldn’t solve by holding it in place myself. 2. 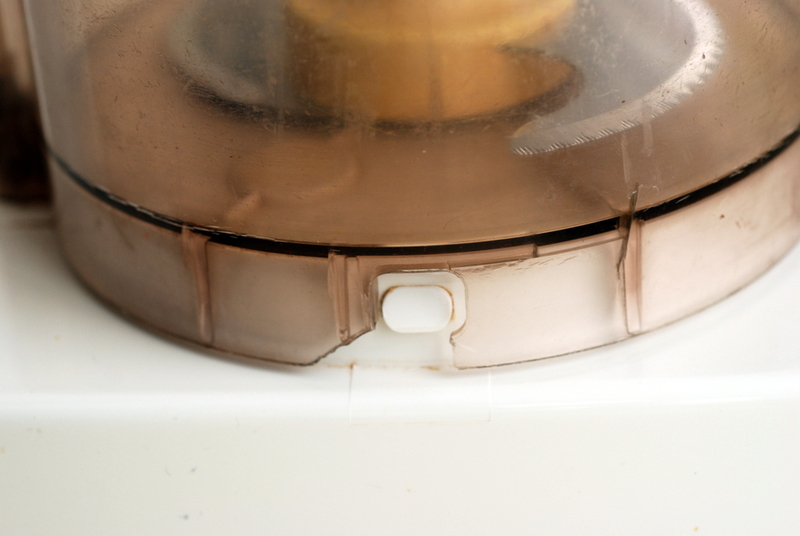 Do not overflow your food processor with fluids. This was courtesy of Rob’s lesson. 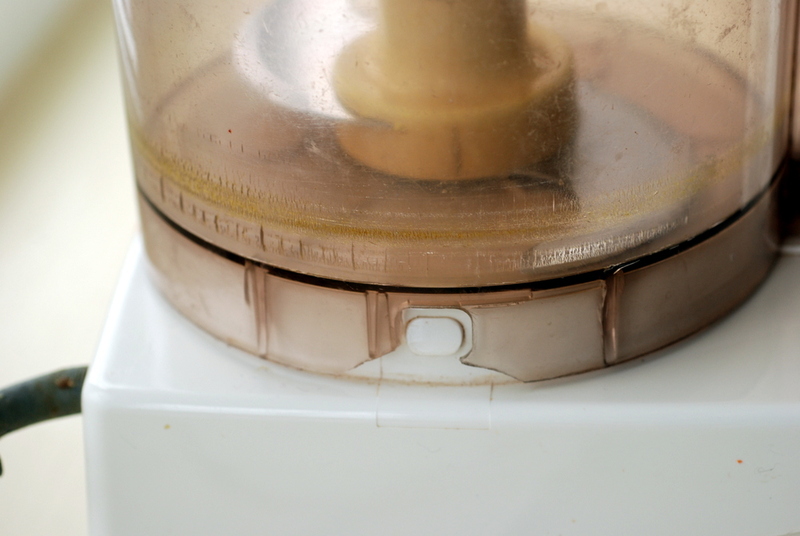 The overflowing liquid can make its way inside your food processor and get it to stop working. Thank goodness my Dad knows how to open up a food processor and clean up the insides. This is another lesson from Rob. Processing soaked chickpeas (but not yet cooked chickpeas) broke his food processor (he only had it for a week) but this beast plowed through it. 4. Don’t give away extra bowls for your circa 1970s food processor. 5. Crazy glue only works temporarily. The final straw for my food processor was when the little tip broke off. My Dad crazy glued it back in place, at my insistence. He was worried the whole thing would be glued shut. I proved him wrong. It still stuck together and moved! The problem, though: it snapped off again (while making The Great Vegetable Bolognese Sauce). 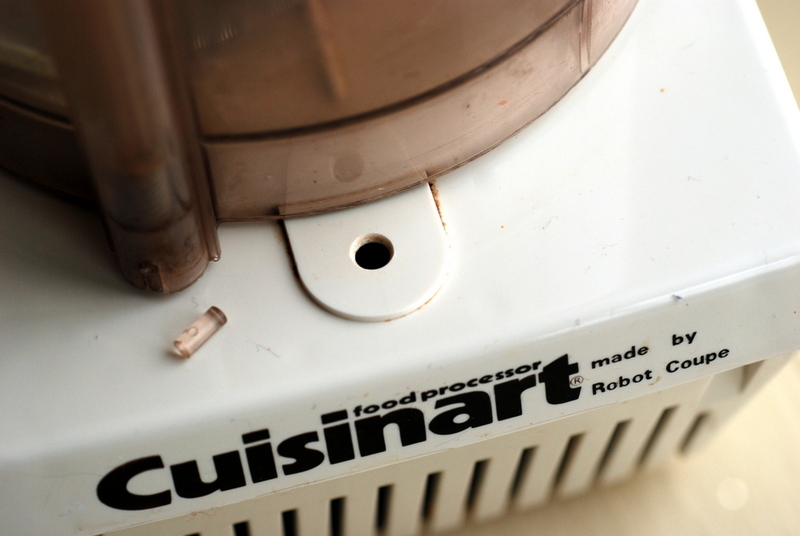 While I can manually stick that teeny piece back in its place, instead I decided to retire my food processor. *sigh* It is for my own safety. I still remember the first time I tried the amazing 1-ingredient banana ice cream. Gena titled her post: “Banana Soft Serve: This Post Will Change Your Life”. And it was miraculous. However, without a food processor, it cannot be done. Something about the air whipping/melting the banana into a creamy soft pudding. As much as I love my Vitamix, blenders can’t do it. Creamy smooth smoothies, yes, but simple ice cream? No. Super simple, I rarely make it more complicated than a frozen banana. I have paired it with raw banana maca pancakes and stewed vanilla-scented peaches and blueberries. For a chocolatey treat, adding chocolate protein powder is a great recovery snack. 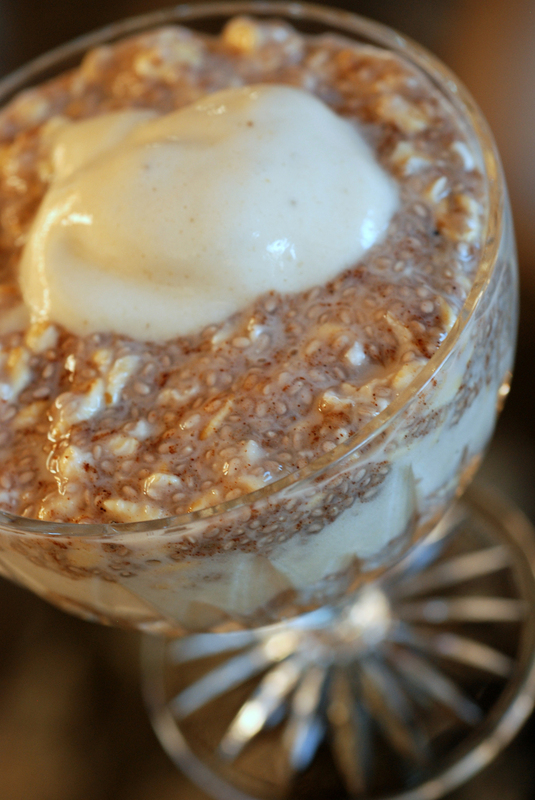 For its ultimate farewell, I teamed the banana soft-serve with another oldie-but goodie: overnight oats with chia seeds. I’ve shared versions with chocolate & cherries, avocado and gingerbread pumpkin, but this one was a classic vanilla-cinnamon combination. Combined together, it is a glorious breakfast. And if it wasn’t so much of a fuss to clean the food processor, I’d gladly eat this every day. I feel kind of bad since it is the bowl that needs replacing and not the motor unit. Sadly, Cuisinart does not sell replacement bowls any longer. I think my Mom tracked down a seller in San Francisco. The commute might kill the value. What do you think? Time to give it the farewell party? 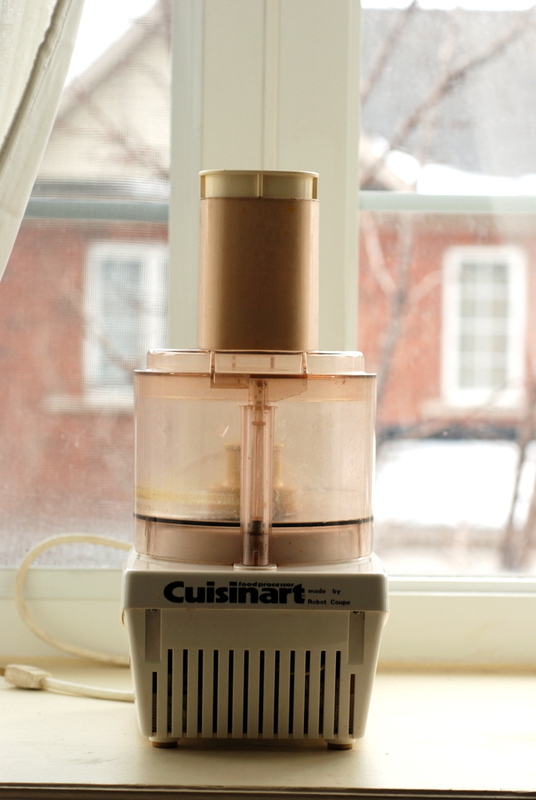 How old is your food processor? I have been blogging for over 3 years (and cooking for myself for the past decade), so you’d think I’d have figured everything out in the kitchen by now, right? OK, I know what I like but I love trying new things. It is harder to pinpoint what I don’t like. (Other than celery). 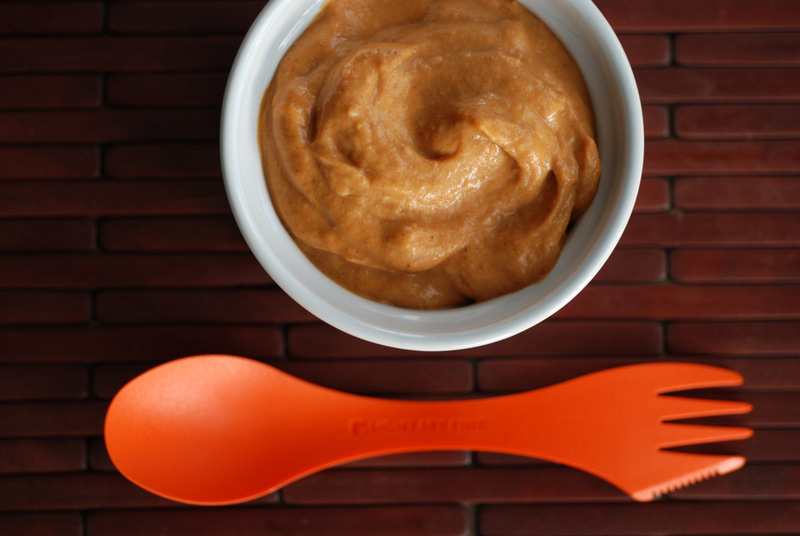 With my never ending stash of pumpkin puree, I whipped up a quick and simple pumpkin pie pudding. It didn’t woo me. While I grew up with turkey at Thanksgiving, we rarely had stuffing (no one likes it), sometimes had cranberry sauce (not sure who likes it) and we never had pumpkin pie (who knows why). I don’t know if I have ever had it except as a raw cheesecake from Naked Sprout (which doesn’t really count as traditional pumpkin pie). This is my submission to Ricki’s Weekend Wellness and this month‘s Simple and In Season. How many of you are weather watchers? Now that I am biking to work again, I watch the forecasts closely. On rainy days I track the radar throughout the day to figure out when it would be best to bike. Hourly forecasts, too. But please, how many of you watch the weather to determine your weekly menu? I am pretty good about making the majority of my meals on the weekends and scooping out leftovers all week. But sometimes I don’t want to eat what I’ve already made. Sometimes I don’t want salad. Case in point: Wednesday. 30% chance of rain in the afternoon. I’ll take my chances, thanks. By the time I was finished at work, it looked wet outside but it didn’t look like it was raining. I consulted the radar: the rain had ended and it had just skirted the city anyhow. But I walked outside and it now it was lightly raining. I pummeled home on my bike, when it rained even harder. I was cold and wet by the time I make it home. The last thing I wanted was salad. I wanted something warm and cozy. And quick. So I did what everyone turns to in such a panicked state: breakfast for dinner. Not wanting to eat my latest breakfast oats, I went with a savoury twist. 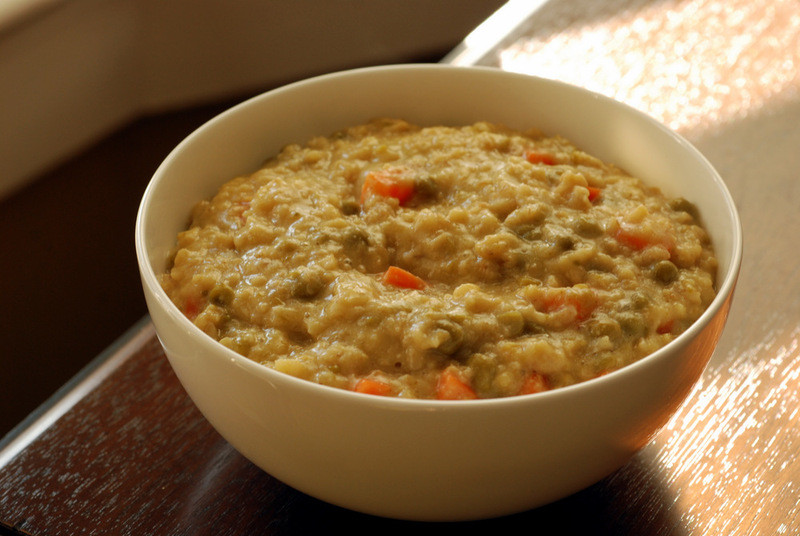 I boiled my oats with vegetable broth, threw in some leftover cooked peas and carrots, stirred in some nutritional yeast and miso and I was in heaven. I’ve done the savoury oats thing before, but I had forgotten how lovely it was. Plus, I never ate it for dinner, with the vegetables thrown in for good measure. While this was great the first night, I found myself craving it throughout the rest of the week, too. 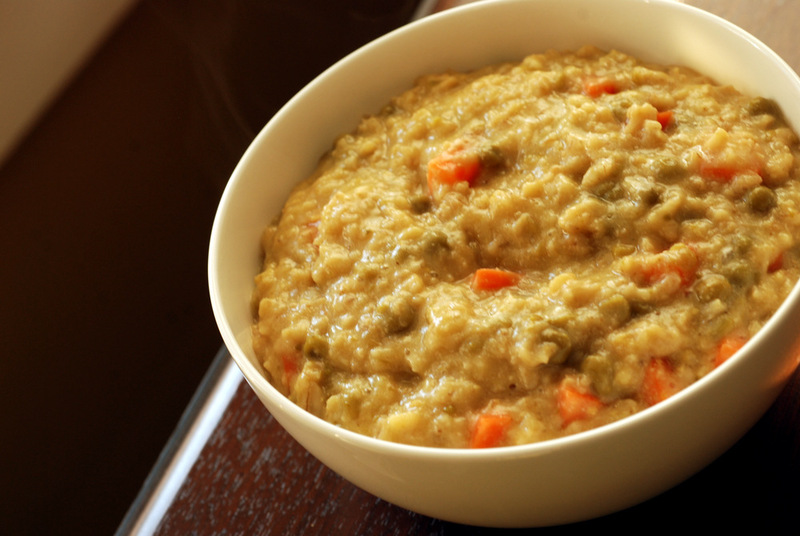 Nooch plus miso works so well here and you can throw in all your leftover vegetables. I tried it with uncooked carrots, but they weren’t able to lose their crunch by the time the oats were done, unfortunately. Just throw in cooked vegetables. The peas worked really well. Not sure where else canned mushy peas would be so awesome… (other than the Malai Koftas from Easter, recipe forthcoming!). This is my submission to Ricki’s Wellness Weekend. My cousin’s spouse recently told me he cooks his for 20 minutes. WHAT?! Mine always takes 35 minutes, if not 45 minutes. I wouldn’t have it any other way. That’s how I get mine to be super creamy. Because it takes so long, I make a big batch to last me all week. Leftovers heat up beautifully and I can mix-and-match my flavours each day. I start by dry-toasting my steel cut oats as the water heats up to a boil (1:4 ratio). When they become fragrant and lightly toasted, I turn off the heat. Usually by this time, the water is boiling and I plop it all in, and then simmer it for 40-45 minutes. I refrigerate the oats and take out a portion every morning. Heat it up in the microwave for 2 minutes along with a touch of water. From there, I add my flavours: cinnamon, vanilla, fruit, flax seeds, nuts, nut butter, etc. My recent breakfast fix has a chocolate base. I use the Chocolate Amazing Grass coupled with Manitoba Harvest’s Hemp Pro 70 for a hearty foundation. I also typically add some fresh fruit, but lately I’ve been cleaning out the frozen fruit from the freezer: this time with mixed berries! Why Amazing Grass? Beyond its nutritional benefits, I really like the taste (Rob doesn’t like it, though). A slightly malty chocolate taste with low calories and a good protein ratio. 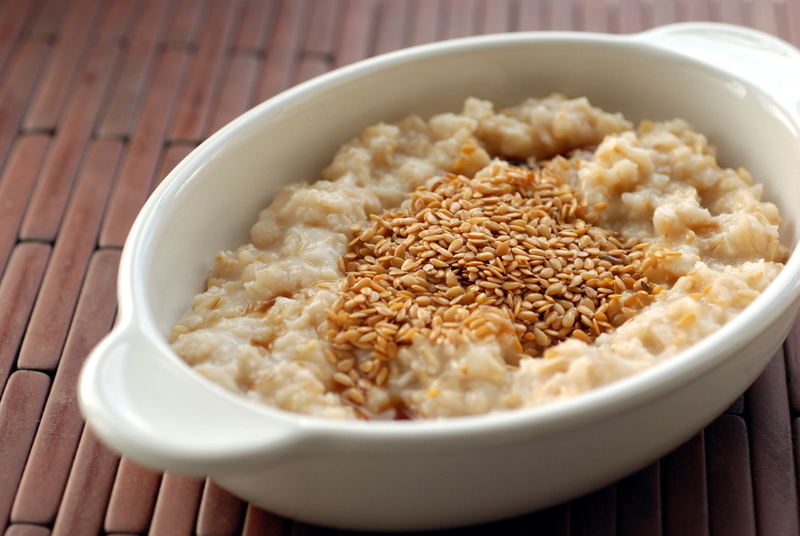 While I am partial to steel cut oats from the bulk bin, one of my non-bulk favourites is from Essence of Life. The texture is a bit more creamy. I find Bob’s Red Mill a bit too chewy. My cousin’s spouse, though, recommended Bob’s Red Mill. He suggests using a big pot (a great tip for no spillover!) and to do a hard boil for 18 minutes uncovered and then 2 minutes covered. He keeps it covered and then lets it sit off the heat for an additional 2-5 minutes. Says it never fails him. I know there are other variations for cooking on steel cut oats: start with a boil then leave the oats overnight, or just soak them overnight for a chewier texture. 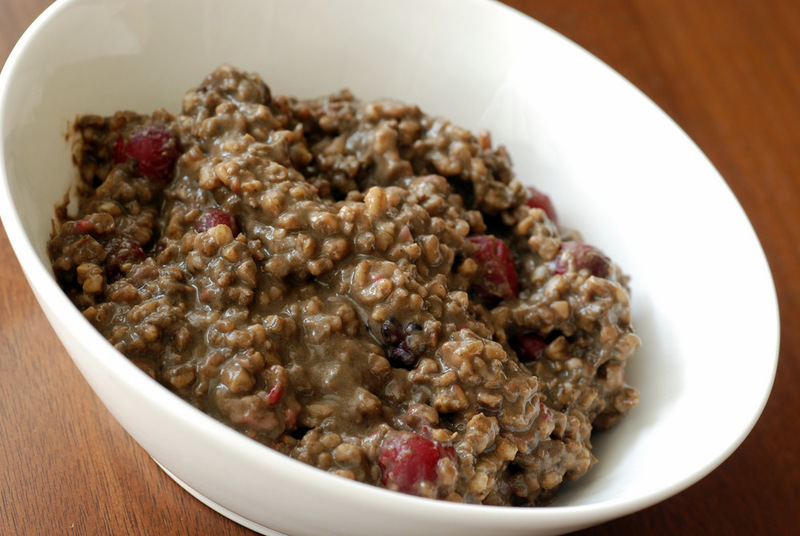 I’ve tried overnight slow cooker steel cut oats, but it was way too watery. Hence, I’ve stuck with my classic, yet lengthy 45-minute boil. 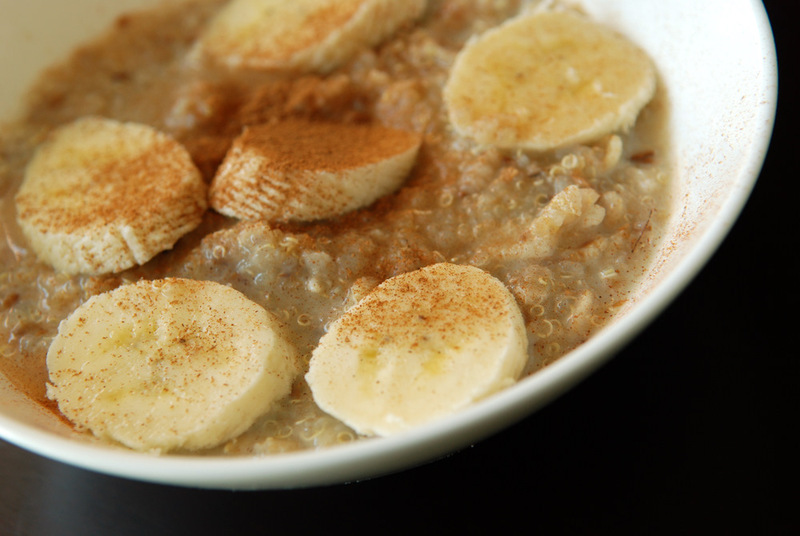 Tell me, how do you cook your steel cut oats? I thought my friend with a kitchen with 4 spices was minimalistic. Not so. It can get much more barren. At least there were pots and pans. And a Magic bullet! I recently stayed with my friend in her tiny bachelor apartment in New York City. Before heading out to buy some fixins for some meals, I scoured her kitchen… It was pretty bare. Some olive oil and salt. Some pepper. Some knives and a cutting board. A microwave but she didn’t have any pots or pans for her stovetop. My plan for a dinner stir-fry was thwarted. I knew I had to become a bit more creative. Armed with chopped kale, lemon, roasted beets and baked tofu, I had the ingredients to make a tasty salad for a few days. I actually wanted to make a wrap, but they don’t sell Swiss chard or even large (uncut) kale leaves. I used the simple dressing from this kale salad with cranberries as a rough guide. I tried to make a dressing with some hummus, too, but it didn’t work out too well since it was rather dry. Next time, I might try adding more lemon juice, like Kalyn does here. This is my submission to Ricki’s Wellness Weekend and to Cara’s Healthy Heart Challenge. When Rob’s parents came over for the barbecue, they helped out by bringing some marinaded meat for the grill. They also gifted us with some fresh, sweet corn on the cob for lunch and peaches for the smoothies. And as a bonus, mini cucumbers from their garden, new potatoes, apples and kohlrabi! And broccolini! These days, there is nothing better than fresh Ontario corn and peaches. The peaches were delectable as I have been snacking on them for breakfast all week. I also made this stovetop simmered peach and blueberry dish with cardamom, courtesy of My New Roots. It reminded me of the baked rhubarb and apple dish I made with earl Grey tea, cardamom and orange last year, which was one of my favourite desserts. Instead of turning on your oven, though, you simmer peaches and blueberries with cardamom, vanilla and cloves for a warm, almost sultry combination. 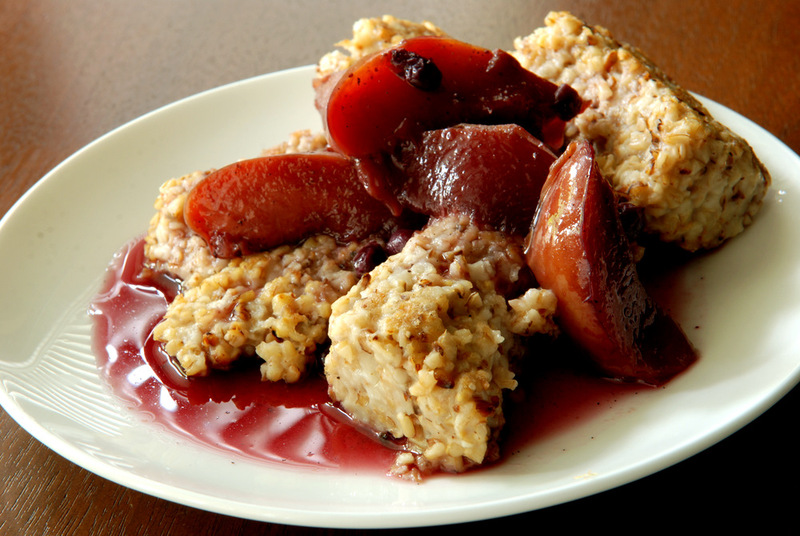 The level of sweetness will depend on your peaches, so add the maple syrup to taste. To contrast with the warmness of the fruit, it is nice to pair with something cool. Pick your favourite – yogurt, ice cream, or in my case: banana soft-serve ice cream. I still marvel at the simplicity of banana soft-serve ice cream and figure I should share the recipe/method for those who have yet to be introduced. 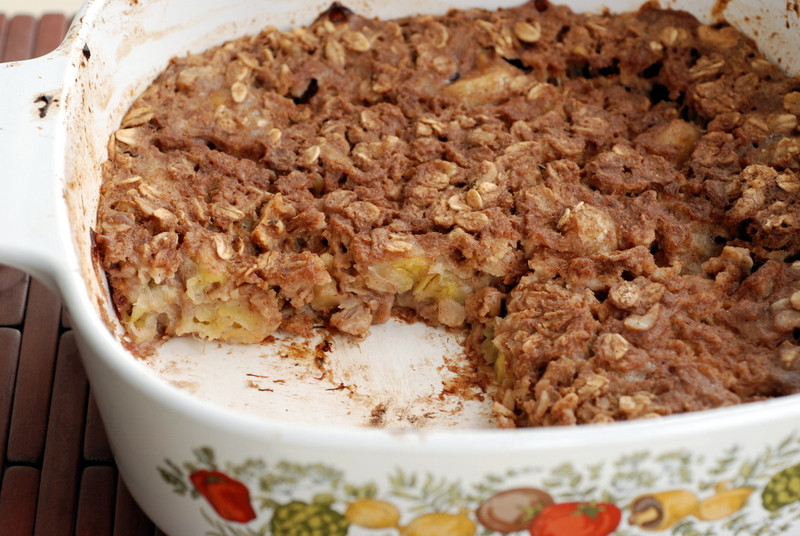 Basically, you take a few just-ripe bananas, slice them and freeze them in a single layer. When you want your ice cream, take them out of the freezer, plop them into your food processor and whiz away. Your bananas will go from hard to a thick cream and if you keep going for a few minutes, eventually you get silky smooth ice cream with a hint of banana flavour. This trick also works with other frozen fruit – I’ve done mango and papaya, but banana remains my favourite. I only caution you not to let your fruit thaw first because then it won’t work! I love desserts that can double as breakfasts. The fruits also worked well overtop my morning oatmeal. I have been going through Bob’s Red Mill steel-cut oats, and found they made much more firmer oatmeal than I was used to. Ricki’s idea to pan-fry the oatmeal sounded ideal. I took leftover oatmeal, cut in large slabs, and fried them with a touch of oil in a non-stick frypan. The outsides were nicely seared with a warm, oozy interior. Thankfully, my pantry-substitute, Better Bulk, has steel cut oats that give me silky smooth morning oats. This is my submission to this month’s Veggie/Fruit a Month, featuring peaches, and to Ricki’s Summer Wellness Weekends. After my success with combining grains into my morning porridge (technically combining seeds since it was a quinoa-amaranth-chia concoction), I decided to try again with another multigrain breakfast. 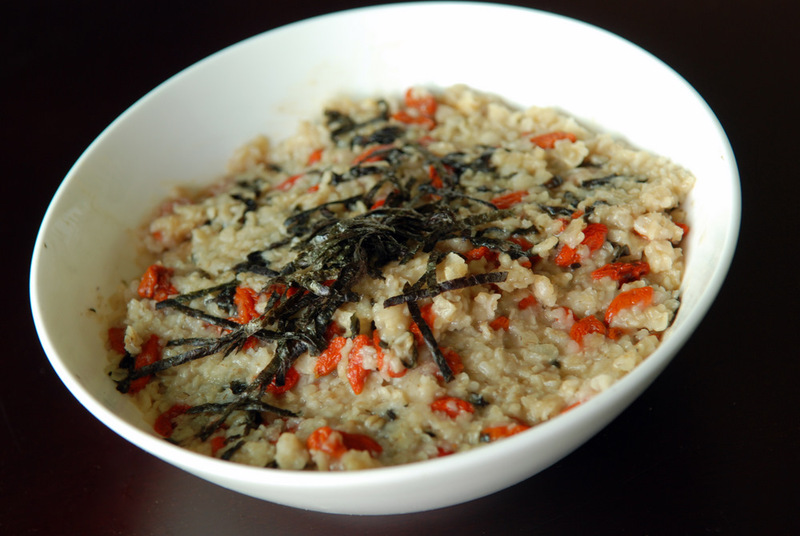 I spotted this combination of oatmeal, quinoa and kasha in The 30-Minute Vegan (recipe also posted here). 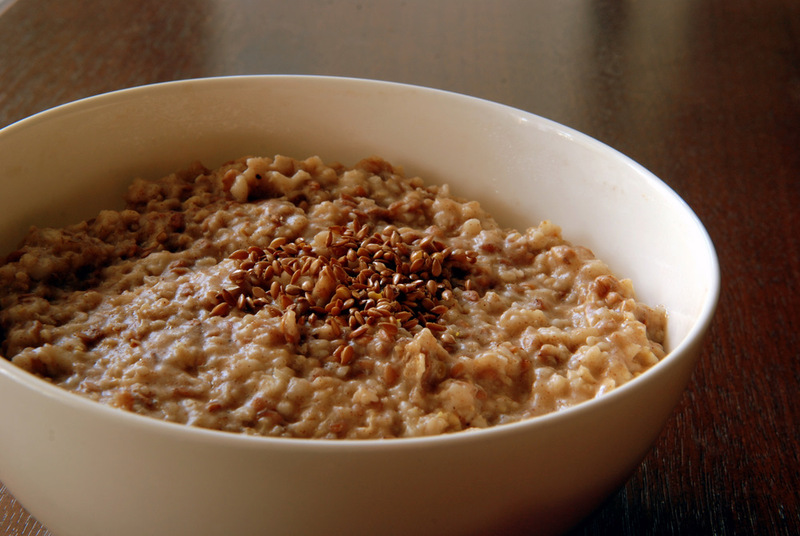 You have to tend to it a bit more than traditional oatmeal since each grain gets added in separately, but it created a wonderful texture. You get the nutty quinoa with the creamy oatmeal and truth be told, this was my first time eating kasha, but the combination was wonderful. I added in some sweetened soymilk at the end so I did not feel like it needed anything additional with the bananas. However, use this as a template to add your favourite oatmeal toppings, with the bonus of a new texture for your breakfast porridge. This is my submission to Healing Foods featuring bananas. When you eat alone, you may eat things that are odd. Cereal for dinner? I did that one too many times while in university. So quick and easy! 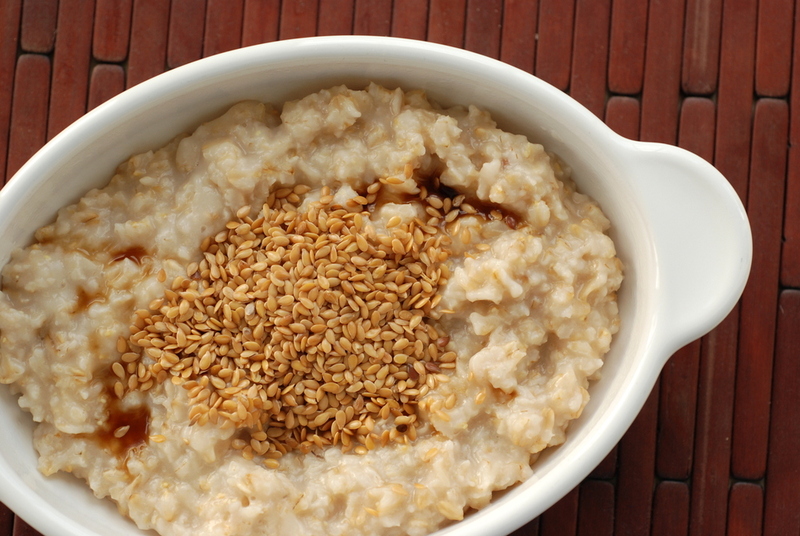 Unless you are making steel cut oatmeal, regular or quick cooking oatmeal falls into the same category: quick and easy meal. 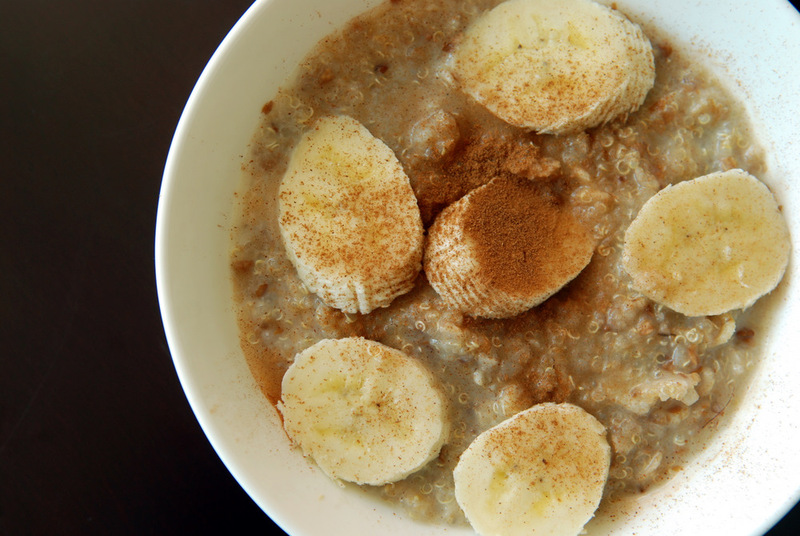 Since exploring savoury oatmeal for breakfast, I didn’t think twice about whipping up a batch of oatmeal after coming home from Vancouver and then again for breakfast the next day. I was craving something warm and homey, after eating a lot of raw foods last week. 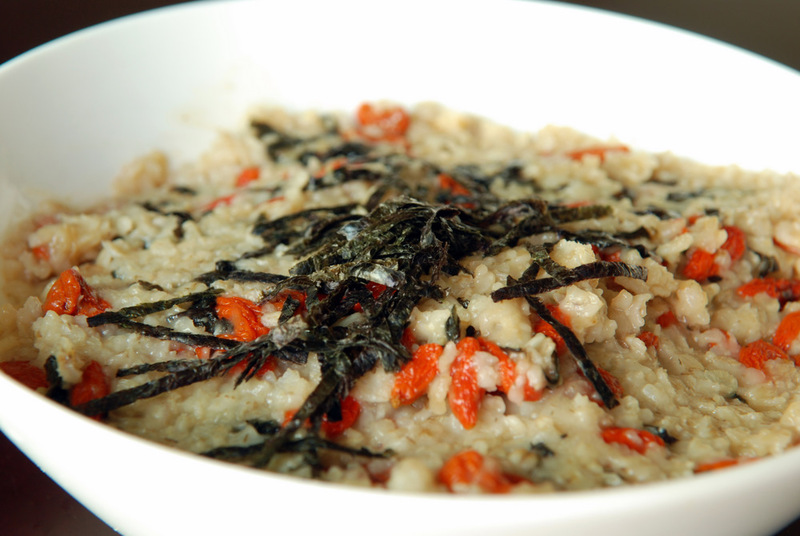 With Vancouver still on my mind (the sushi capital of Canada), I decided to spice up my ponzu-flavoured savoury oatmeal with strips of toasted nori and goji berries. Seemingly odd ingredients, but all hailing from somewhere in Asia, it worked really well together! The goji berries plumped up nicely and offered a hint of sweetness with some chewiness. The nori brought a comforting sushi-flavour to the dish, the citrus from the ponzu was light and refreshing and the quick-cooking oatmeal was slightly lumpy, but in a good reminds-me-of-rice kind of way. I have been experimenting with more unusual ingredients lately: maca, delicious! Carob, yup. And now goji berries. Can I blame Tess’ new cookbook all about superfoods? Perhaps… but blame isn’t the right word, praise is more like it. 🙂 While I also believe that common fruits and vegetables are superfoods with all their vitamins and minerals, it is nice to spice things up with new ingredients. Taste is the most important, though, which is something I will never sacrifice (the health benefits of goji berries may be overstated). But let me share a secret: these wacky “superfoods” don’t have to cost an arm and a leg. Even seaweed (nori, etc) and dried mushrooms can be expensive at health food stores. However, people have been eating seaweed and goji berries for years. Head to where they are native to find cheap supplies – and no, I don’t mean China. Head to Chinatown or your favourite Asian grocery store (Sunny!). Here, goji berries may be labelled as red medlar, though, which is why they have gone under my radar until now. Goji berries are so much cheaper, only a buck or two, whereas I know Whole Foods charges a lot more. 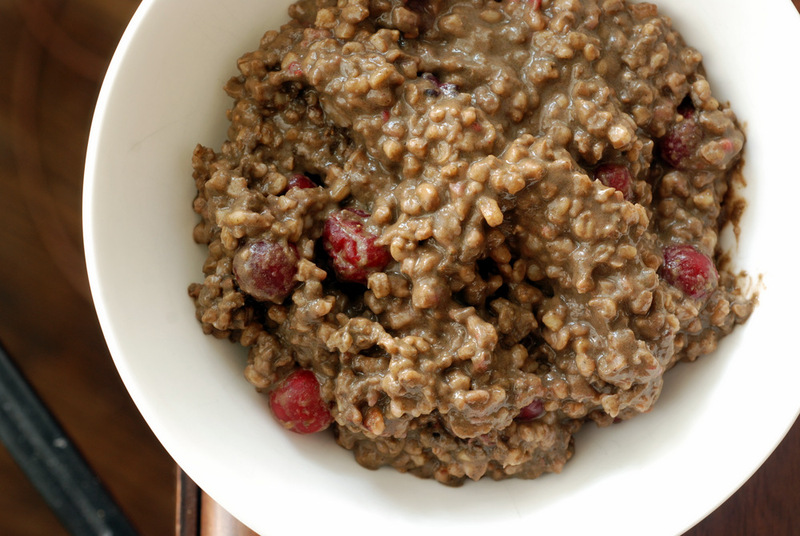 While goji berries are a bit lackluster straight from the bag – they taste like a tart cherry in the guise of a dried raisin – they are much better once they are plumped up in the oatmeal. Because they aren’t cloyingly sweet like most dried fruit, this paired well with the savoury nori and ponzu sauce. This is my submission to this month’s Breakfast Club, featuring berries.